For this next card, I went girly and blingy with the new Deco Bag die. 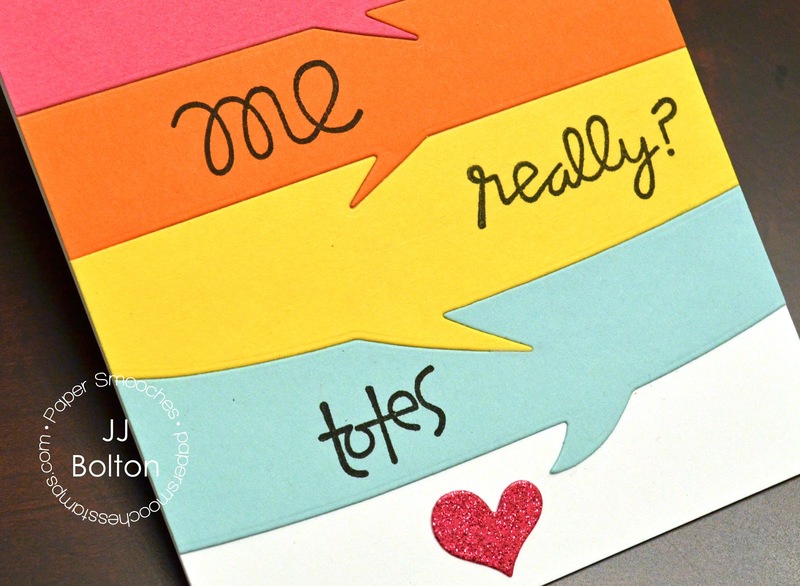 This card is the perfect size for a gift card or small favors. It's also perfect for making a quickie shaker card. I die cut the deco bag in vellum and used scor-tape to put it together. I filled my shaker with lots of sequins and lots of glitter. I found this oversized hexagon shaped glitter at Michael's and it's perfect for shakers! 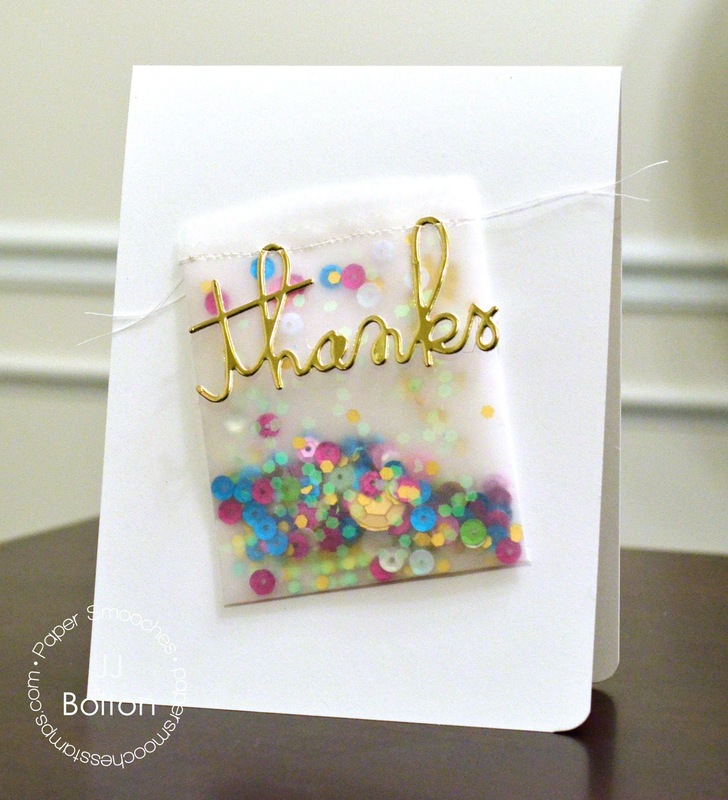 To seal the top of the bag, I sewed on the die cut sentiment cut in metallic gold card stock. Love all the sparkle! My last card uses the new Quotables dies. I love the scale of these dies! They fit across an A2 card and I love that they have left-facing and right-facing dies:) I die cut each speech bubble so that they all hook together like puzzle pieces. That's it for me today! I hope you go check out all the new Paper Smooches goodies this month! Hope you have a wonderful weekend! Love your fabulous projects, JJ! That giraffe cracks me up! Love these! I have to ask, where did that gold cardstock the "thanks" is cut out of come from? It's FABULOUS! Chrissy, I got it from Michael's of all places:) I usually don't buy much there but I found this in the front where they keep single 12X12 sheets. With the glitter sheets:) I love it and haven't been able to find gold card stock that I like as much as this one. Love these JJ! That giraffe is cracking me up on the first one, and I love the conversation going on in the last! Your cards ROCK, Miss Lady!! You never seize to amaze me, JJ. Love the cards. Hmmm, I may just have to order those speech bubbles. I think I am addicted to speech bubbles lately. You are so clever, JJ! I love how you played with the deco bag and quotables dies so much! And your giraffe is adorable!!! These cards are all AWESOME!!! LOOOOVE them !!!!! Lovely! Can I ask you where at Michaels you got the glitter from? THANKS!!! I found the glitter in the general craft supply aisle (not in the paper crafts area). They are in these bottles that have a pop open top kind of like spices. One side is regular glitter and the other is this hexagon glitter. I just got some more yesterday, lol! Love it! oh my! The Giraffe card is so funny and cool! Fun, fun projects, JJ! 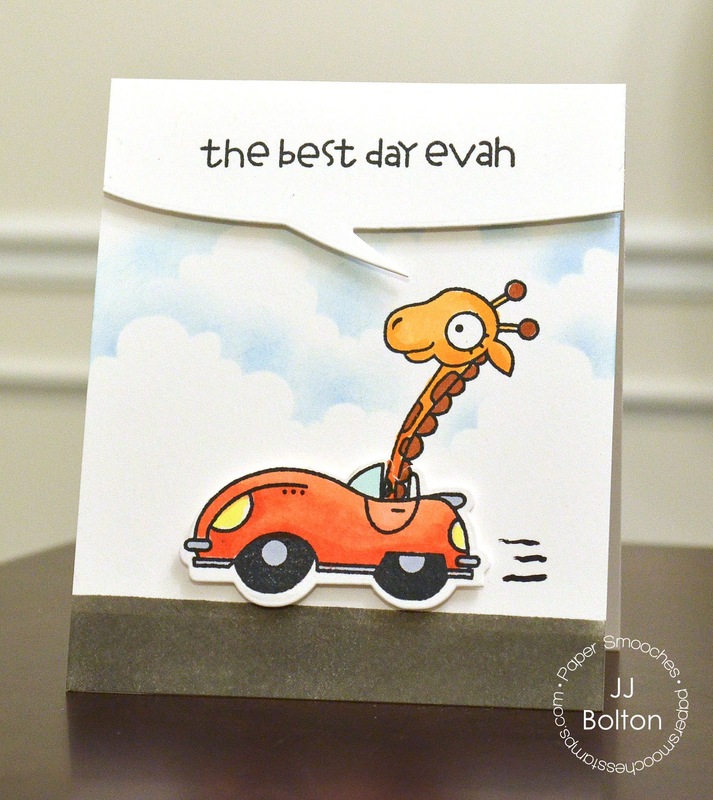 That giraffe card is a hoot and I love it! Love them all, totally inspiring. Fabulous cards love them all!! Great cards! Wow! These speech bubbles are so funny! Brilliant cards! Each one of them is amazing. 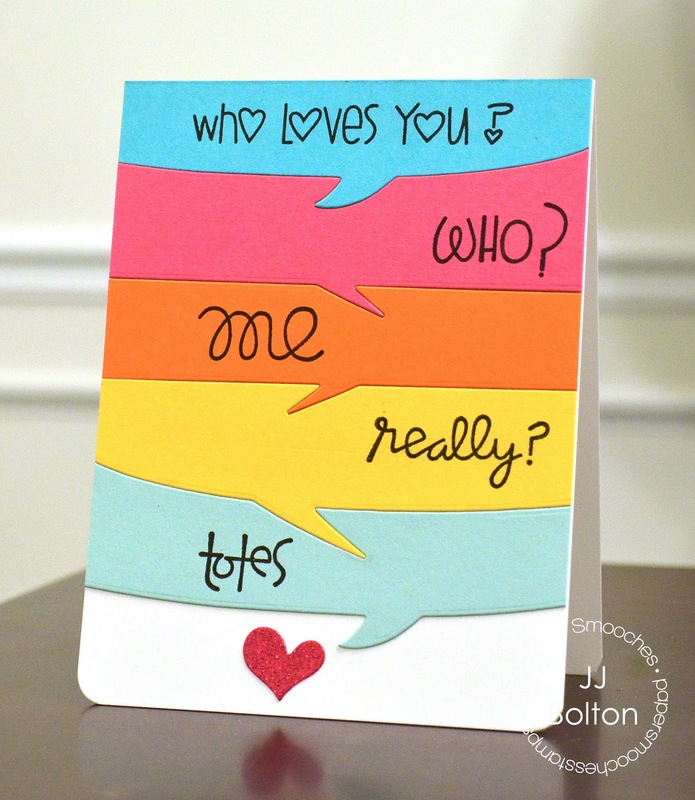 Love the new idea of the shaker card and the way you layered the speech bubbles in the third card is incredible, they fit together perfectly! Amazing creations! Thank you for the inspiration! LOL, OMG, that giraffe card is so awesome! Love these, JJ! Nice job on all the cards. Love all of them. I will keep an eye on that hexagon glitter at Michael's. The sentiment you used in the giraffe card, is that part of a stamp set? I think it will be fun to add it to my collection. Thanks. Totally smiling here! Love the colors and how you fit everything together in a conversation perfectly!